Creates a red portal when summoned. Does flips when idle. Players occasionally summon Kil'rek (from the Illhoof encounter) instead of the Fiendish Imp. As of patch 7.1, this pet's model and appearance have been updated! 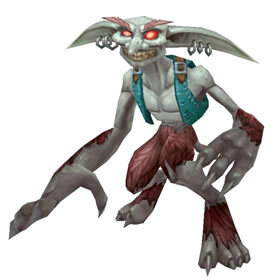 The imp is still albino (White with pink-red eyes and tinted pink fur patched) but now also wears a blue jacket/vest. The imp now also has actual fingers, rather than boxy limbs! Here's mine front and back and closeup indoors. I've tried about a hundred times to get Kil'rek to appear but since the update I have not seen him. Likewise, the Corefire Imp and the Gregarious Grell have also gotten updated graphics as well! Excellent and annoying pet to battle against in PVP. It can, if used right, allow one to control certain parts of a fight if your speed is fast enough. Having the ability to break up an enemies sequence is key and the ability to reheal 36%+ up while sitting as a backline pet is very handy as well. While not a super hard hitter it makes up for it's usefulness in everyother way. Fantastic pet for PvP. With a S/S breed, you'll outspeed the majority of standard 325 speed S/S pets which allows you to force favorable matchups with Nether Gate. Immolation combined with the Humanoid racial lets you both DoT and heal up on the backline. Needless to say, this pet is fantastic when combined with a Minefield user or DoT team. Strangely how one can get attached to some pets. I agree this pet have many advantages in pvp and it looks nice as well, yet I never pvp or pve with my imps even if they are the worst enemys of my winner-team. Get the fast version of this pet and rule the world of pvpe pet battles. He popped out once as Kil'rek for me also on my Monk. Pretty neat bonus! Very powerful pvp pet this one. Kil'rek summon must be random. I got it my first summon, then he wouldn't do it again and my raid said I broke him ; ) But eventually got it again. I got this little monster on my first run with my main. I tried for a second run on an alt, but it didn't drop. Also, you don't have to be a Warlock to be able to summon Kil'rek, just Summon/Dismiss it a few times and he should show up. Yes I noticed that when I summoned him on my warlock, not sure if that's class-specific or not. It would be cool if it is! Sometimes when summoned, you will get Kil'rek instead of the normal imp. A minion of Terestian Illhoof, this tricky imp was left in Karazhan when the portal to the Twisting Nether closed behind it.